I've been hearing about the fabled Samario's Pizza for months now from a friend who seems like he goes there about 4 times per week. I've heard about how everything on the menu is incredible, but for my purposes I had to keep it strictly to pizza this time so I placed my order for a 6 cut Old Forge Red. As I sat down in the really relaxing and elegant dining room and waited for my pizza to be ready, I kept thinking to myself, "Can this pizza really be that good?" 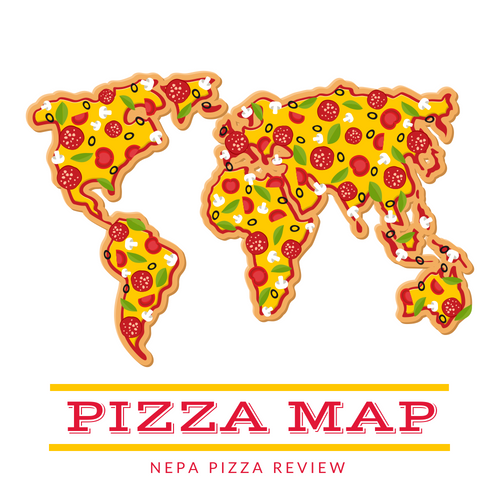 As a pizza critic, I never take anyone's opinion for my own without trying it for myself, so I was quite interested in finally putting an end to all of the suspense. At long last, the pie arrived at my table, and I could tell immediately that this was going to be a pizza I was going to like. The crust was clearly just freshly made as I could smell the slight smell of fermented yeast (you know the smell when you catch a faint smell of beer? - it's a good thing!). 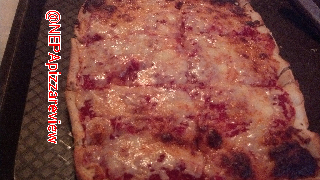 The crust was crispy, almost flaky, which is sort of unique for an old forge pizza. 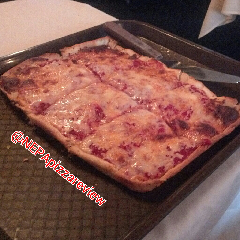 I liked how it was a bit on the thin side for a square pizza, and boy did it have a nice flavor and slight crunch. If you haven't figured it out from any of my prior posts, I'm really a sauce guy. This can make or break a pizza for me. This sauce really grabbed my attention and was nothing perfection. I found it to be really well balanced - slightly acidic, but countered with the perfect amount of sweetness. The seasonings in the sauce were understated and really let the flavor of the fresh plum tomatoes explode through. I appreciated that this sauce had some texture and wasn't pureed into a fine pulp. Many people are offended by onions in sauce, and I really didn't detect any in this sauce so if they are present, they aren't really prevalent. The cheese was very god as well. I think I appreciated the fact that the pizza wasn't overcheesed, which allowed some sauce to show through, and of course allowed the flavor of my favorite component to shine. The thin layer of cheese was melted and cheesy in the middle, and crisp and browned on the edges, which meant that each bite was a new taste adventure. A consistent pizza inside to out is a good thing, but sometimes when a pizza is put together and cooked properly, you really get a full spectrum of flavor as was the case here. So I loved the sauce, cheese, crust, cooking, the way it was prepared. I almost feel bad giving high praise and not having some constructive criticism here, so I'll nit-pick a bit here and say that for some reason the pizza being served on a brown cafeteria tray (no wax paper underneath) kind of didn't work for me. I mean, I'm sitting in a classy dining room, listening to Seriously Sinatra Radio, being taken back to the old country, and out comes my pizza on a plastic tray? I don't know, maybe a stainless steel tray would've calmed my unnecessary comments! THE BOTTOM LINE: Overall, this is a complex pizza that stays true to fresh ingredients, intricate flavors, and the finest quality. This is among the best Old Forge Style Pizzas I've ever had. I'd like to give a shoutout to "the birdman" for recommending this fine establishment. It was a true pleasure, and I can finally say "You were right."